Need high-performance managed VPS and dedicated server hosting? Require expert 24/7 customer service? Read our review of KnownHost to find out if it’s right for you. Some things in life are worth paying a little more for. In the world of web hosting, there are dozens of cheap services to choose from all competing on a value-for-money ticket. But what if performance and security matter more to your business than the lowest possible price point? What if you would prefer to pay that little bit extra and get your site purring like a finely tuned supercar? If quality matters more to you than cost, you should check out KnownHost. KnownHost only offers high performance virtual private server (VPS) and dedicated server hosting, which guarantees fast connection speeds, high availability and plenty of storage space. For any business which relies heavily on its website, such as an online store, these are the kind of credentials you need for peace of mind. You need qualified confidence that your site will always be functioning whenever your customers use it. What is more, KnownHost only offers fully managed hosting plans, which means they take care of all the tech stuff for you. In other words, you don’t need to be a digital whiz to run a site which looks and performs like one of the bigwigs. With KnownHost, it is all part of the service. By now, you are probably thinking all of this sounds great, but it must be way out of your price range. If so, read on, as you may be pleasantly surprised. What are the Limitations of Shared Hosting? What’s the Difference Between VPS and Dedicated Server Hosting? What’s Included in the VPS Plans? Does KnownHost Offer a Reseller Program? Is Managed WordPress Hosting Available? What Do I Need to Know About Billing and Service Guarantees? Where are KnownHost’s Datacenters Located? What are Some Good Alternatives to Knownhost? Is KnownHost technical support only available during American Central Standard Time? Does KnownHost have an affiliate program? What upgrades or add-ons are available for KnownHost cloud servers? KnownHost is an American hosting company which has been in operation since 2005. Under private ownership, it has grown into a truly global brand, with customers in over 150 countries worldwide. The core of its operations remains in the US, with three state-of-the-art datacenters in Washington state, Maryland, and Texas, and a support office located in Birmingham, Alabama. In addition, KnownHost operates one overseas datacenter in Amsterdam. KnownHost emphasizes its fully managed hosting and 24/7/365 customer and technical support. KnownHost prides itself on two things in particular: the quality of its network infrastructure and its dedicated, round-the-clock support. All of KnownHost’s data centers are highly reliable carrier-class facilities, with multiple connections to some of the biggest network carriers in the US and Europe. In the Netherlands, KnownHost uses the mammoth Interxion network. Forty-five state-of-the-art facilities span Europe with gateways to Latin America and North Africa, Asia Pacific, Central and Eastern Europe, Russia, and North America. For customers, all of this translates into exceptional reliability and outstanding network performance, with world-class access to markets across the globe. 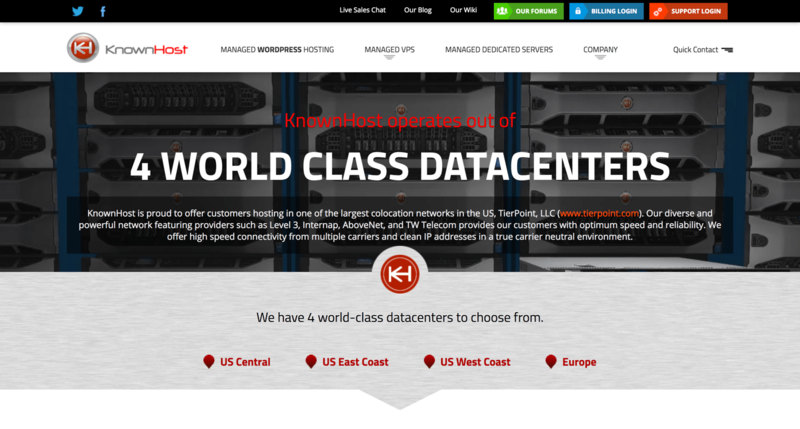 Reliability and resilience are supported by KnownHost’s use of 4 world-class datacenters. If you want to check out connection speeds to any of the four facilities, you can find the Test IP address and a test file to download on the KnownHost website. All four data centers are fully redundant, with RAID 10 failover mirroring for every server and high levels of physical security. This all helps KnownHost to maintain its proven 99.996% proven uptime record. To put that into perspective, that amounts to an average of fewer than two minutes’ downtime for your site every month. 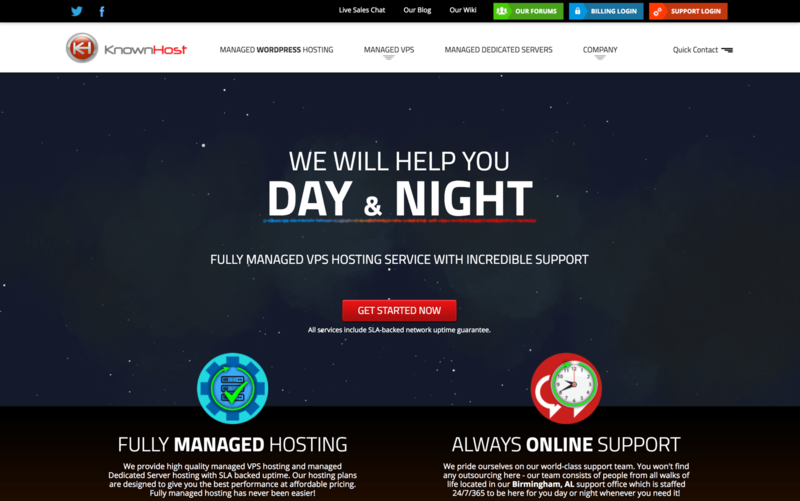 As a managed hosting provider and one of the better-known VPS hosting providers, support is a critical part of the KnownHost offer. Its customer service and technical teams provide 24/7/365 support from its Alabama headquarters. Email and website help desk tickets are handled around the clock from around the globe, with a guaranteed response within five minutes. US customers can also call via a toll-free number. Billing support is available between 7 am and 7 pm CST Monday to Friday, via email, telephone and live chat from the KnownHost website. In addition, there are dedicated billing and support portals for registered customers, plus an active forum, wiki, and blog to help you grow your knowledge and troubleshoot. KnownHost offers fully managed shared hosting plans. With shared hosting, every client website gets its own dedicated slice of physical server space, sharing capacity and bandwidth with other sites. The benefits of shared hosting are that it is low cost and easy to administer, and for sites with low-to-middling traffic, shared hosting will usually provide enough juice for everything to run fine. Free website migration from another host. Zero downtime. The limitations of shared hosting emerge on sites with high volumes of traffic, or with the sort of data-heavy content that needs a lot of bandwidth to function optimally. That’s when you want to look into VPS or dedicated hosting. This is where VPS and dedicated server hosting comes in, and where KnownHost specializes. With a dedicated server, instead of getting just a slice of the server resources, you get the whole lot to yourself. That’s a lot of power for one site, and taking over a whole server is expensive. VPS is the affordable alternative. Using virtualization technology to pool together physical server resources, VPS creates independent nodes each with their own memory, disk space and CPU — just like an independent server. The higher levels of efficiency this achieves means you get performance approaching that of a dedicated server, at a price point closer to a shared hosting plan. People sometimes cite the extra complexity of running a site on VPS as a drawback for the non-specialist user. It helps, for example, if you have experience with Linux. But as KnownHost only offers managed services, you don’t have to worry about this. 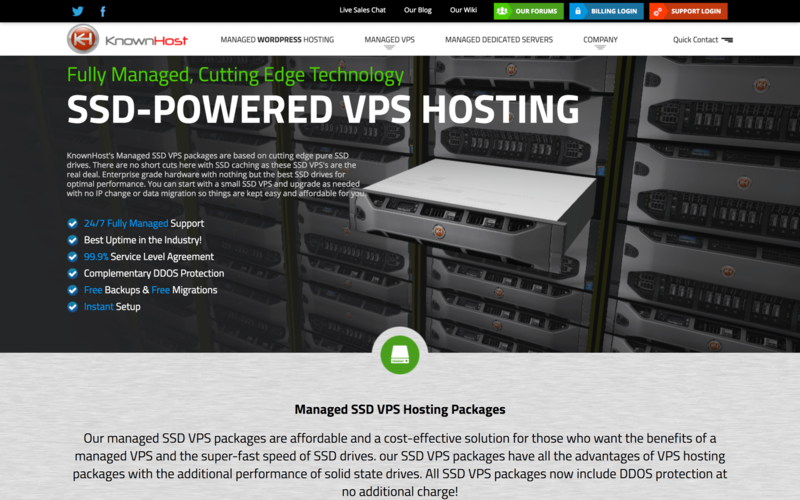 KnownHost’s VPS hosting uses solid-state drives for superior speed and reliability. You can think of VPS hosting as being the next step up from shared web hosting. The logistics of a VPS plan are similar to those of shared hosting in that you, and several other sites, are all using one physical server. The key difference, however, is that there is strict delineation in terms of resource allocation — you will never tap into your neighbor’s and your neighbors will never tap into yours — leading to improved performance overall. With that said, many hosts expect their VPS hosting customers to tackle most, if not all, of the system administration such hosting requires. If this is not something you want to add to your to-do list for whatever reason, you can get the power of a VPS hosting plan without the added workload by opting for a managed hosting solution. Essentially, managed options are those where the web host tackles most of the infrastructure related setup, configuration, management, and maintenance on your behalf. 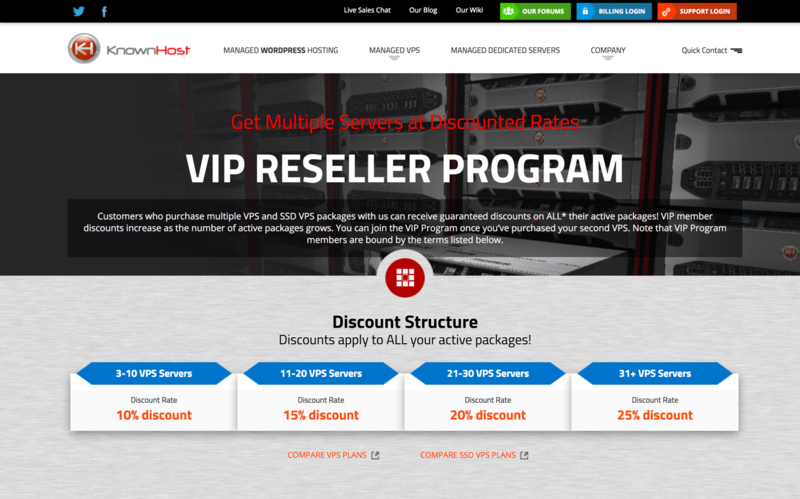 KnownHost offers two flavors of VPS hosting. The key difference is the type of server the virtual private network is built on — the SSD service uses super-fast solid-state drive technology, adding that extra bit of kick compared to the standard VPS hosting. Nonetheless, KnownHost custom builds all its server hardware, SSD and otherwise, to enterprise-grade standards of performance and stability. Customers can choose between standard servers or SSD servers at any of KnownHost’s US datacenters. In Europe, just SSD is available. Round the clock support and service management. 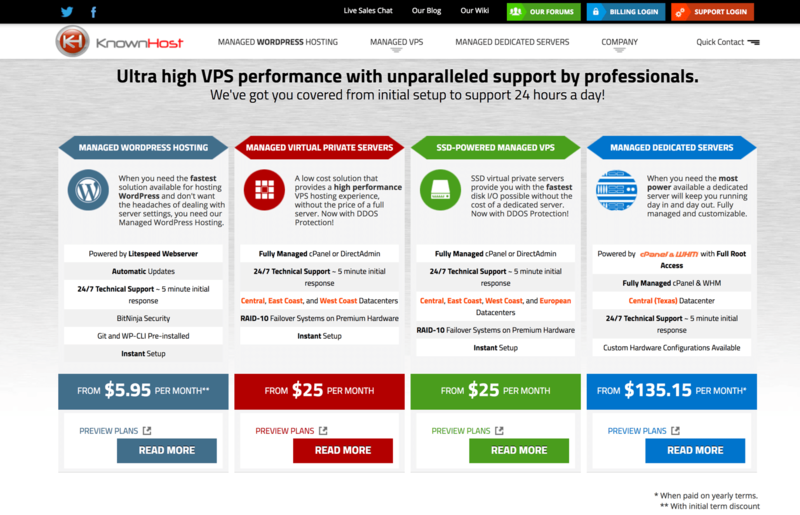 There are seven tiered VPS packages available, and six SSD VPS packages. Bandwidth: Standard VPS packages range from 3000 GB to 17000 GB, SSD packages from 4000 GB to 13000 GB. Disk space: Standard VPS from 30 GB to 190 GB, SSD from 20 GB to 115 GB. RAM: Standard from 1280 MB to 8.25 GB, SSD from 1.25 GB to 7.25 GB. CPU cores: All standard VPS packages offer 16 or more CPU cores, on SSD plans it ranges from eight to 24. In reality, there is little to separate the two types. As they start at the same price point, SSD offers marginally better performance for the cheapest options, but the standard plans score better at the highest tiers for only a slightly higher cost. KnownHost dedicated servers are custom built and deployed at its Dallas, Texas datacenter. The fully managed hosting service comes with many of the same benefits as the VPS packages, minus inclusive IP addresses. Dedicated servers do, however, come with both cPanel/WHM and Softaculous control panels, plus additional failover protection in the form of external backups. The emphasis on high performance also comes with reasonable costs. The discounts apply to all existing accounts you hold, so if you wanted to start a sideline in reselling hosting, you could save yourself some money on your own site. You can earn revenue with KnownHost’s reseller program. Yes. Knownhost offers two fully-managed plans from which you can choose. Knownhost claims that, by opting for either of these options, you are choosing something that is easier to set up than even shared hosting plans. If you choose to switch hosting to KnownHost, they will help you migrate your existing site free of charge, depending on the control panel you currently use. If you use cPanel, DirectAdmin or Plesk, KnownHost will transfer your site over to cPanel for free, as it will for DirectAdmin to DirectAdmin. Migration of sites from other control panels is charged at an hourly rate. Once you sign up for hosting from KnownHost, each client gets a login for dedicated billing and support sections of the KnownHost website. KnownHost’s VPS and SSD VPS hosting plans can all be billed monthly, quarterly and annually, with discounts for the longer billing periods. Dedicated servers can also be paid for six monthly, and also incur a setup fee. A range of software add-ons are available on a similar basis for billing purposes. The closer your data centers are to your visitors, the faster your page loads. If your visitor base is primarily in North America or Europe, you should be golden. This does not mean that you cannot (or should not) opt for Knownhost otherwise — it just means your visitors may see longer page load times. All new customers get a 30-day money back guarantee on all VPS and SSD VPS plans, with no need to give a reason. This offer does not apply to dedicated server plans. KnownHost guarantees 99.9% network uptime on all its hosting plans. Its confirmed statistics are actually better than that, at 99.996% availability. The SLA confirms money back in the form of a credit if the service does not meet the 99.9% guarantee, at a rate of 10% of your monthly bill per 0.1% uptime drops below the guaranteed level. This guarantee does not apply to ISP or local network downtime, problems caused by internal site applications, or planned maintenance. If you are in the market for more premium options, you have likely seen (and possibly considered) Liquid Web and Digital Ocean. Depending on what your needs are, Liquid Web is pretty comparable to Knownhost, in terms of pricing and feature set. Both offer fully managed services (though Knownhost does so even at the shared hosting level), and both companies pride themselves on their top-notch customer service and support. Digital Ocean is aimed at developers (or those comfortable with using the latest and greatest in technology). Digital Ocean’s offerings are very powerful, but for small business owners looking for easier solutions at affordable price points, we do not recommend its offerings. Specialists in hosting for high traffic, high-performance websites. Advanced network with proven availability record. Managed services offering expert assistance with the technical side of managing a website. No affordable shared hosting solutions offered. No ancillary website services offered, such as site building. No option to manage your own site – fully managed hosting only. Here are a few questions we’ve received about KnownHost. Contact us if you have more questions you’d like us to find answers for. Technical support staff are available 24/7/365 via email or help desk. Sales and billing support is available anytime via live chat and by phone from 7:00 am – 7:00 pm CST. Yes. It’s free to participate in. No technical knowledge is required. After you sign up you’ll receive banners and referral links to use on your digital properties. Any visitor to your site who clicks on one of your links and then purchases a KnownHost package will be counted as a referral. The commission range is from $10 – $300. Payouts are made on the first of each month. While we try to provide you with all the information you need to make an informed decision, sometimes you want more. That’s why we recommend checking out our sister site WhoIsHostingThis.com. It not only has answers to frequently asked questions but also reviews from actual KnownHost customers. If you want to know what it’s really like to host with them, this is the place to find out. Our Verdict: Safe all-round choice with great support. Previous: StartLogic Hosting Review: Powered by Wind Energy. But Can This Host Power Your Business?